Okay ... I just need to come right out and confess. I am so smitten with my hummingbirds. I just can't get enough of them and don't even ask me how many photos I have. Chasing each other. Up, down and around. And then, sometimes stopping long enough for me to snap a photo through my window. There used to be only one or two coming to my feeders. But lately there are 5 or 6. I'm thinking the young ones have fledged and that's the reason for the numbers now. Like this little one today. I'm thinking he might be a male. See that little bit of red under his neck! 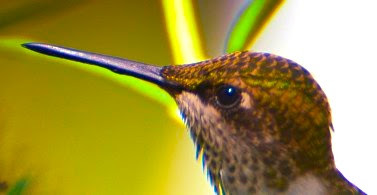 I think he is a young Ruby-Throated Hummingbird. I'm hoping some of you bird experts can verify this. Since this is my very first season to bird watch, I have a lot to learn! He was quite busy this morning. Chasing everyone away from the feeders and then coming back to the butterfly bush under my window. He kept an eye out and as soon as he spotted a competitor, he zipped after them and gave chase. You can never tell which direction they may come from. And then, sometimes you just need to take a rest. And hope no one catches you sitting down on the job. Cute captures of the hummingbirds. The are a delight. Great post and photos. Great shots of the hummers. I really like the fluffed one :). that would be my guess too - a young male. and that fluffed out shot is really great! I feel the same way...they are so endearing. I love when they perch on a branch-too cute for words. These are gorgeous Reena, and I promise you that if we had more of them here, I would be equally as smitten and have just as many photographs, but not nearly as nice as these. Just beautiful!! 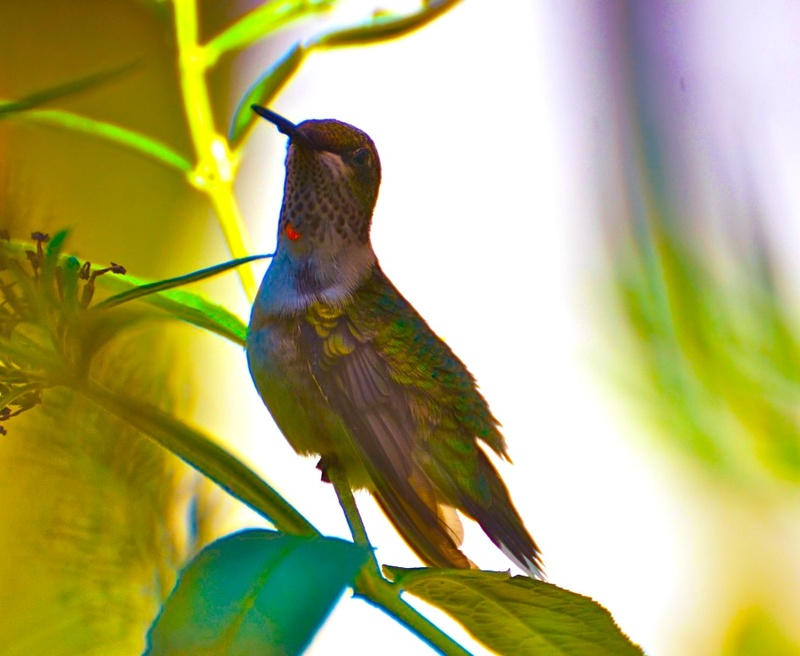 Reena -- you are absolutely right, a juvenile male ruby throated hummingbird. I've put my feeders out hoping for some of the early migrants but no luck yet. Guess another week or so before they find me. Last fall, it was an absolute extravaganza outside my sewing room window. I won't tell how many pictures I took either! (hehe) That was the first time I'd ever been able to catch them, too. Enjoy the little ones. WOW!! These are amazing pictures Reena!! I took pictures of them landing at the feeders at my brother's place in Kentucky, but none were as good as yours!! Reena! These photos are spectacular! These critters are so allusive around here. I could get addicted as well to them. I love actually "seeing" what they look like. I didn't realize they were ever that still. And to think I have trouble just photographing guineas. These are delightful! I've never seen such a varied array of hummingbird poses! Awesome images! What a gift to have so many of these beauties coming to feed. Bet you stay entertained with these guys. I hear they can be quite territorial. I, like you, adore these little birds. They are so delightful Your pictures are amazing! I can't do anything like this with my little point and shoot so I really appreciate them. Well who wouldn't be smitten with these sweet little birds!! I wish I was able to capture the hummingbirds here. These are amazing shots. I can't get close enough with the lens I have. Maybe time for an upgrade! I am pretty sure I would NEVER get anything done if we had the interesting wildlife in our yard as you do! Love these shots! Hummingbirds are truly fascinating! Your photos are pure magic. Oh wow, these are just beautiful shots! And such gorgeous subjects too :) I do think that last one is my favorite. I love them too! Especially the little sounds they make. GREAT shots! Such pretty pictures of them! My aunt Linda loves birds too and she is trying to get them to come to her feeders too!! I wish I had hummingbirds to chase. YOu capture them so well! Oh so beautiful. As always. You can post hummingbird photos anytime. I absolutely love watching them. 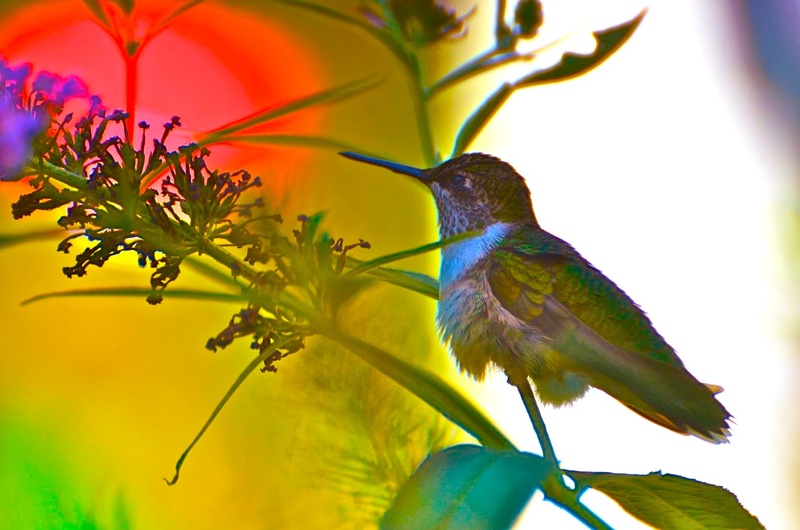 Your hummingbird photos are wonderful! 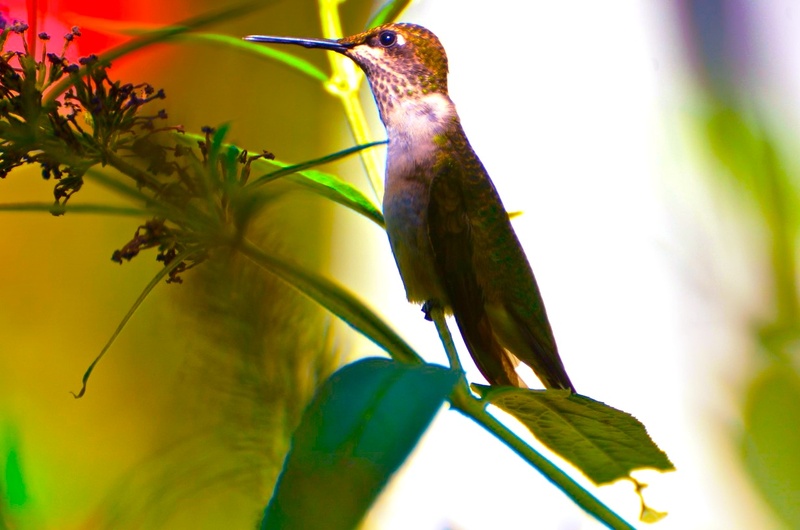 I love hummingbirds, too, Reena, and your photos are so beautiful! Hope your week is going well! Enjoy! Those shots are unbelievable. They look like paintings. Such beautiful little birds. I'd love to see these one day. Beautiful catpures, I love hummingbirds. these are so lovely! I have never seen a real hummingbird! Absolutely delightful post! I love hummingbirds, too. We have a feeder, but have only seen one occasionally stopping by. I don't think he likes all the ants and bees who seem to have taken over. Some really great photos here. Awesome shots...I can't get any good photos of ours...They just won't stay in one place long enough. Shots 5, 6 and 7 where he is keeping watch are fabulous. In England we don't get hummingbirds. I think they are absolutely fascinating so having them here is just a delight. Last year I did not put out a feeder but I've been reminded and inspired by your posts and video so I bought a new one last Friday. Saturday morning we saw our first hummingbird and my 4 year old loves seeing them. We only get the very tiny brown ones, but they are still amazing. Your pictures are amazing. You must have a tripod. What kind of camera are you using? Just wonderful. shot 4 is my favorite! 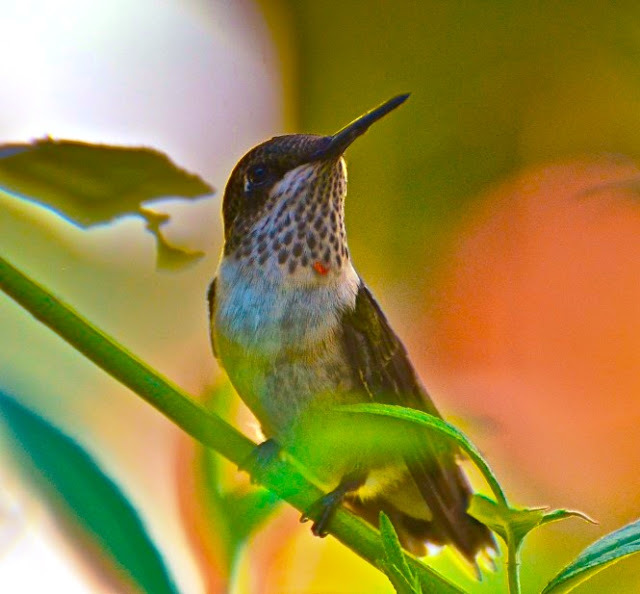 I am now wishing I lived where hummingbirds liked to hang out AND that I had a 300mm lens, darn you Reena and your amazing bird photos ..
Gorgeous photos, Reena. I love the colours in the last one. It's magical. don't apologize. i would also be totally distracted if i had these all around me to keep me entertained !!! i love hummingbirds and totally believe that they are one of the greatest gifts ever given to us. These are stunning photos, the colors are magnificent. 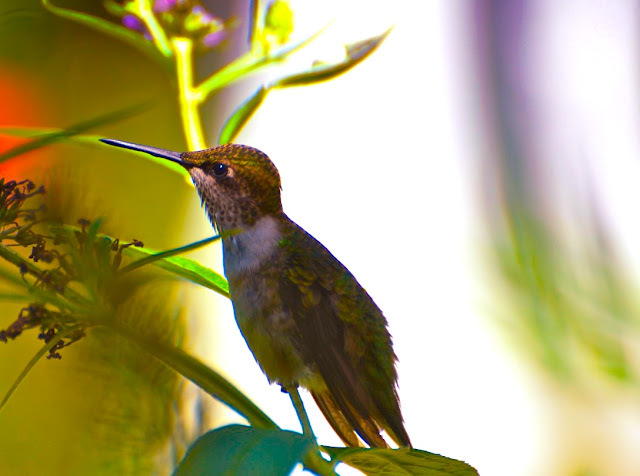 One of your regular readers, Liza, suggested I visit your site because of the hummingbirds, and I'm glad she did. Wonderful photos. Bravo! He is precious and what wonderful shots! I'd never get tired of snapping their pics either! Reena, thanks for stopping by Bee Haven Acres...we are also in PA...central part. Doing our best at self sufficiency and keeping a sense of humor thanks to our lovely critters! Love your hummers. They keep us delighted, here also!! It looks like a youngster to me. Hummingbirds will do that and chase away another who comes into their territory. I have seen only one here this year. Usually we have several. These are JUST BREATHTAKING!!! You are an artist with your camera! I want one of those captures up on my wall....just beautiful! these are wonderful and ever so delightful captures.. what a blessing to have them in your own yard.. and get to see them everyday.. I am sure you computer is filled with photos of them.. I know mine would be.. they are so amazing.. Such beautiful photos, they brought smiles all over! spectacular! and my favorite as well. i think they spend more time guarding and chasing than actually feeding! definitely, a young male rub-throated! I'm delighted to meet you, Reena, and will definitely sign up to follow! These hummingbird shots are wonderful - I've not had luck enticing them into my garden, and so enjoy seeing everyone else's pics. I think my backyard feeding station is a bit too racous for them, with the very loud Steller's Jays, the bossy crows and the insatiable squirrels who scamper about eating everything I put out for the birds. Thanks for stopping by - I'll visit again soon! Wonderful photos of beautiful birds. We don't have hummingbirds out here so I have never had a chance to watch them that closely. I can understand that you love them, they are relly wonderful. Great photos with very nice coulors! That youngster looks a bit - well - ruffled! Your photos are magnificent - capturing the spirit of the bird. 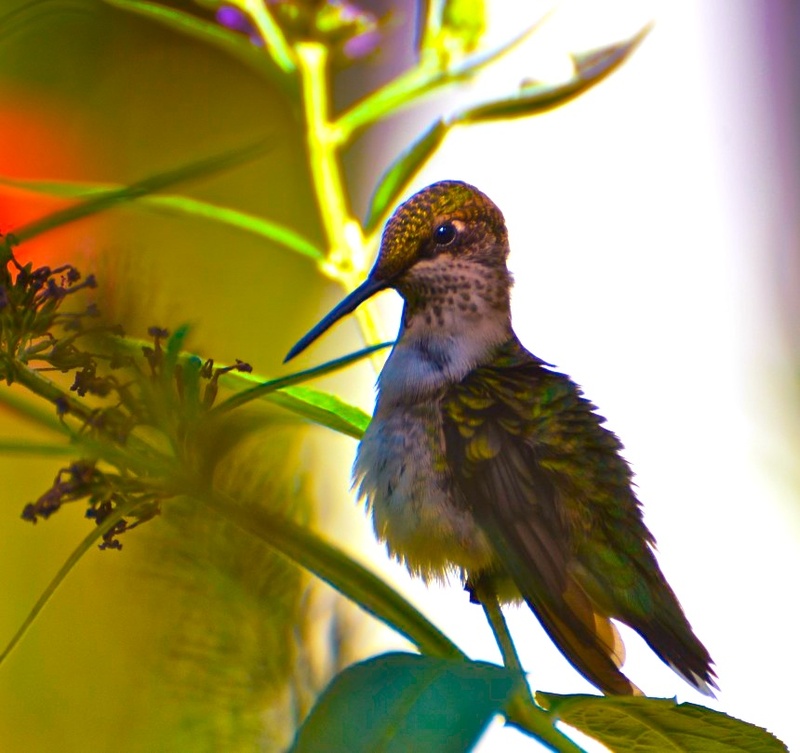 Reena, I'm smitten with hummingbirds, too, and your images are stunning! I like your little story, too. Thanks for your nice comment! Hi Reena, I LOVE the passion you have for your hummingbirds! and how you photograph and write about them. this is pure pleasure. What a wonderful post. And judging by the number and quality of the comments it generated, many agree. What a wonderful set of shots! They look so gorgeous. Never seen a real live one before but...Hey, you got plenty here :) Thank you!! I have fond memories of watching Hummingbirds in Texas some years ago so I can understaand why you would be constantly distracted by them. Lovely series Reena. Really beautiful photos for Outdoor Wednesday!! i loove hummingbirds! i mean loooove them! 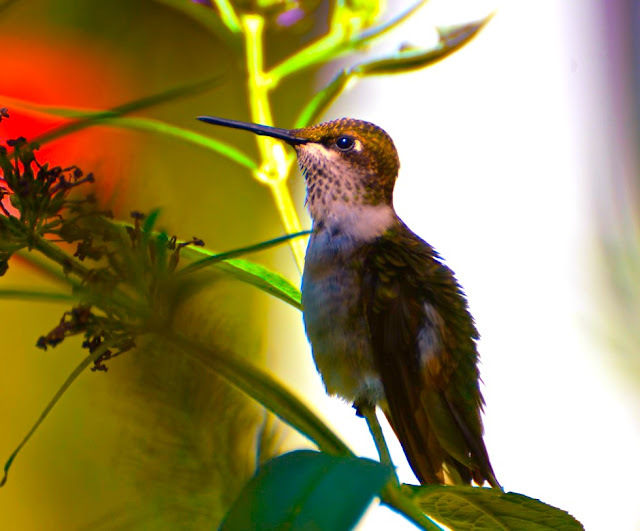 everytime I see one, i smile and watch.. drives my hubby nuts as last time i did that i was so enthralled with the hummingbirds I fell of the curb hehe.. oh well! :) the things we do for picture taking! and i still managed to get a great one of the mum feeding the baby. I would be right there chasing the hummers with you if I could! I am totally knocked out by your pictures. You have a really unique take on things. Way cool! Lovely shots of the Hummers! Mine are very shy. Great shots of a truly interesting bird!! Boom & Gary of the Vermilon River, Canada. We always compare them to tiny helicopters. Love them to pieces! Beautifully captured! Gorgeous colors! You have a wonderful eye. Oh I'm way behind and catching up on blogs, but wanted to say how I loved these photos! Such detail captured! You are very talented. Your photos are awsome.